Design: Tough, ideal for difficult screwdriving jobs e.g. in sheet steel or metal..
Torque increases continuously during screwdriving operations without any abrupt occurrence of peak loads until the screw head reaches the material surface. 1/4'' hexagon over the entire bit length, extra-hard, ideal for difficult screwdriving jobs e.g. in sheet steel or metal. Extra-hard bits are made from a special material that extends the service life of the tool and reduces the danger of material breakage. Recognisable in the catalogue through the article letter Z. The 05072082001 Wera 855/1 Z 1/4'' Pozidriv Insert Bit is one of thousands of quality tooling products available from MRO Tools. 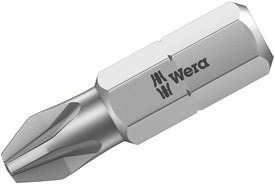 Please browse Wera 1/4'' Pozidriv Insert Bits for tools similar to the 05072082001 Wera 855/1 Z 1/4'' Pozidriv Insert Bit. 05072082001 Wera 855/1 Z 1/4'' Pozidriv Insert Bit description summary: Wera 855/1 Z 1/4'' Pozidriv Insert Bit. Point Size: PZ 2 Shank Overall Length: 25mm / 1'' Quantity discounts may be available for the 05072082001 Wera 855/1 Z 1/4'' Pozidriv Insert Bit. Please contact MRO Tools for details.